The path to the first Crinkle is seen rising from the left, above the crags of Great Knott. Gladstone Knott lies in front of the first Crinkle. The highest point is on the second Crinkle, Long Top, which is usually ascended via the "Bad Step" from the first. Between the second and third Crinkles is the gap of Mickle Door. Below these lies the ravine of Crinkle Gill. 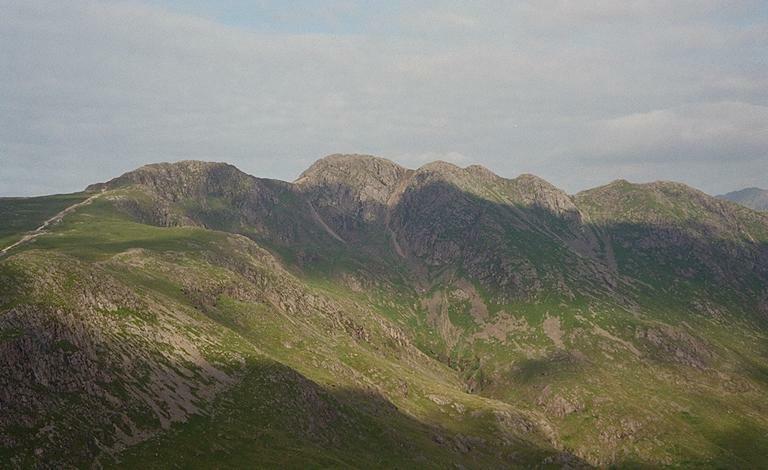 The third, fourth and fifth Crinkles are closer together, and then there is a gap before Shelter Crags. In the distance, on the extreme right is Scafell Pike. Smaller version of this picture.